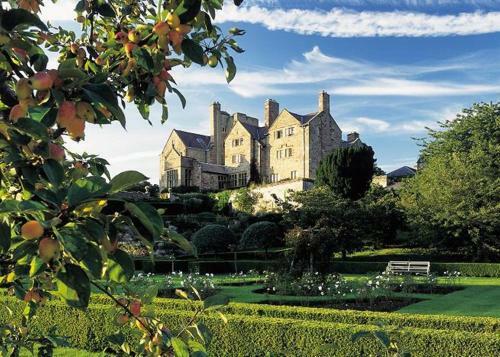 Plas Bodegroes is an award-winning restaurant with rooms in North Wales. A romantic Georgian Manor House with a distinctive wisteria and rose-covered veranda and Scandinavian elegance, it’s the place for foodie connoisseurs to stay and dine on the Llŷn Peninsula. Foodie Travellers looking for a romantic escape in North Wales, will love the beautiful and tranquil setting of Plas Bodegroes. With its heart-shaped lawn, blanket of bluebells and 200 year-old beech avenue, it’s a wonderful place for serious food connoisseurs to indulge in fine dining and good walks. Perfect for celebrating a special occasion or popping the question! Plas Bodegroes (Rosehip Hall), can be found in a secluded location under a mile from the beach near Abersoch on the Llŷn Peninsula, a designated Area of Outstanding Natural Beauty in North Wales. The region’s spectacular scenery attracts walkers to the Llŷn coastal path and visitors to local attractions such as the Italianate village of Portmeirion. For the last 30 years, Plas Bodegroes, run by chef Chris Chown and his Danish wife Gunna, has consistently been one of the top places to eat in Wales. Chris and his team have concentrated on the fundamentals of good food – honest, intense flavours, clever combinations and superb local ingredients, many of which are grown in the restaurant’s kitchen garden. In spring 2016, a new head chef and front of house husband and wife team took over the baton of running the restaurant and business on a day-to-day basis with Chris and Gunna overseeing the operation. Visit for Sunday lunch. Come in May and you can wander down the beech avenue soaking up the scent of the bluebells. Savour dishes such as chicken liver and pork terrine with celeriac remoulade, followed by braised guinea fowl ballotine with cabbage and bacon. Desserts are irresistible. The lemon parfait and curd with strawberry meringue is sublime. Finish your meal with coffee on the terrace snuggled up under blankets with the heavy scent of wisteria wafting all around. Stay at Plas Bodegroes and you’ll find the hotel’s combination of cool Scandinavian elegance, smouldering fires and well stocked bar, deeply relaxing. French windows flood the house with light and the bedrooms which are exquisitely furnished, make the perfect retreat with their crisp linen and stylish bathrooms. With its art collection and deceptive simplicity, Plas Bodegroes is a place you just want to be – and never leave. Use rose hips to make jam, jelly, marmalade, and even rose hip wine. In Sweden, they make “nyponsoppa”, a rose hip soup. They tell me that dogs are welcome but they ask you to kindly email and let them know. Find more Foodie Things To Do in North Wales.